Preheat oven to 350 F. Spray a rimmed baking sheet (15x10x1) and set aside. In large mixing bowl, beat butter on medium-high until creamy. Gradually add sugar until well combined. Add egg and beat just until combined. Add the mashed bananas, sour cream and vanilla. Beat until well combined. In a small bowl, whisk together the flour, baking powder, baking soda, and the salt. Turn mixer down to low and gradually add the flour mixture until well combined. Spread batter into prepared pan and bake for 25-35 minutes, or until top springs back to the touch. Remove from oven and cool in pan on a wire rack. Beat the cream cheese and butter together until creamy. Slowly add the powdered sugar until completely combined. Beat in the vanilla. Spread frosting evenly over the cake with an icing spatula. Cut into bars. 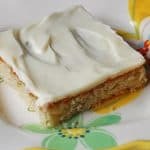 This recipe for Banana Bars with Vanilla Cream Cheese Frosting was printed from AmandasCookin.com - https://amandascookin.com/banana-bars-with-vanilla-cream-cheese-frosting/ and can only be printed for education or personal use.